We conduct Trick Art exhibition at more around 20 places per year both in domestic and oversea. We deliver, install the artworks and set up the site by ourselves to create the exhibition venue where many visitors can enjoy. It is supported by many people as the contents where you do not need to consider the place or size whether if it is art museum or science museum, department store or shopping mall. Mystery and the fun of Trick Art go around the customer to customer and the chain of the smile expands. There is no need to prepare the special equipment unlikely to exhibit the painting or sculpture. It is possible to conduct the continuous event with the new artworks each time as we have more than 1,000 pieces of existing artworks to choose from. Best place to communicate with one’s family and friends. 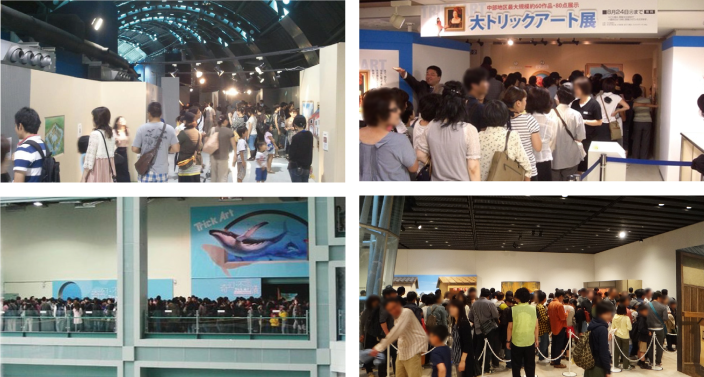 Wide range of people from small children to adult can enjoy the exhibition safely. We offer various event option not limited to the leasing of Trick Art works as follows. Live performance to conduct the hand-painted work at the actual venue. We can prepare the Trick Art workshop for the visitors to experience how to make trick art. Exhibition of Trick AR which the still pictures move once you start the application. It is the newly developed artwork with the collaboration with AR (Augmented Reality) application. We can offer the original goods and Trick Art related items. The lecture and introduction of the work by Mr. Kitaoka, Professor of Ritsumeikan University. Although he is major in Perceptual psychology, he is working on his original research and development including the production of the artworks. Please ask for the fee separately. The height should be higher than 2,700mm. 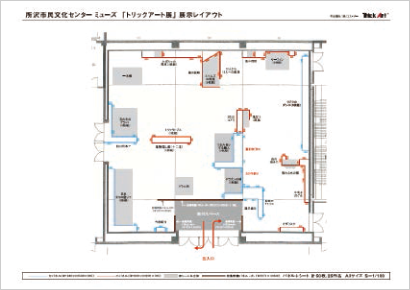 It is mandatory due to the panel size of our artworks. Minimum one week. We can discuss the irregular case separately. Please provide us the address of the Exhibition place or at least name of the city and prefecture in case if confidential. We will prepare the estimation and submit it as the proposal based on the period and the size of the venue. 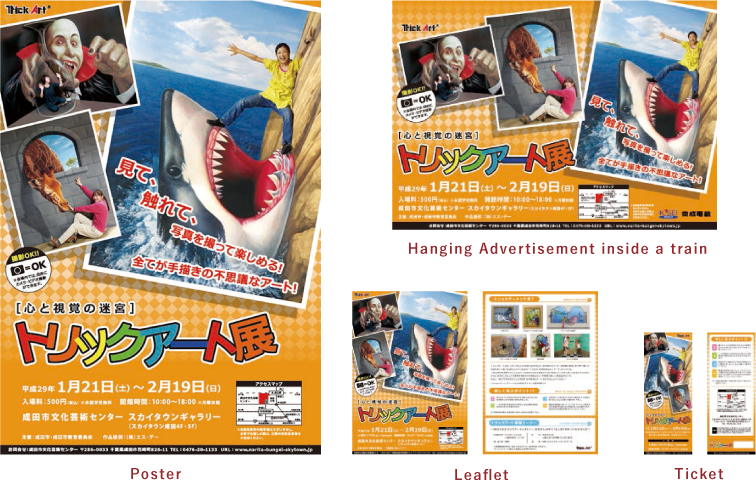 Various signboard and display items. *We will provide the images of the artworks. We can also offer the services of production, printing and delivery of various graphic tools including poster, leaflet and ticket. Please feel free to contact us for further information. *We will submit the estimation separately. We normally ask for 4 to 6 number of assistant staff at the site. *The number may differ depending on the scale of the exhibition. We prepare the proposal for the exhibition layout and the list of the artworks to be presented. *Please prepare the plan map in advance. *We may visit the site for research if we think it is necessary. 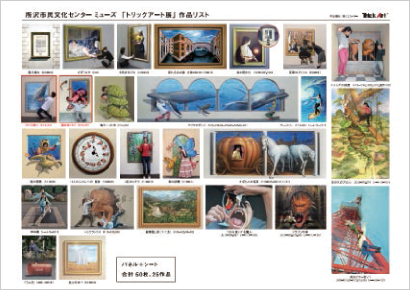 We conduct the Trick Art Exhibition once the layout and artworks are revised, adjusted, and confirmed.